Although I’m an art historian, sometimes I feel that art should just be looked at rather than analyzed to death. When I read somewhere that May is National Textiles Month (May 3rd was National Textiles Day), I just felt like showing you some particularly interesting examples from the Davis digital collection. If I ever teach again (not likely), I would teach a course on the history of abstraction. Believe me, it doesn’t start in the 20th century! One of the reasons I love ancient Andean textiles so much is the abstract quality of the decoration. Come on, this pre-dates Picasso’s (1881–1973) fractured figures! This panel represents an anthropomorphic mythological being or deity. The Chimú (ca. 900–1470) were the successors of the Wari Culture (declined around 700 CE) and Tiwanaku Culture (declined around 1100 CE). The Chimú kingdom, centered in Chan Chan (near contemporary Trujillo, Peru), was a highly organized society where textile artists worked in royal compounds. Unlike other Andean cultures, the Chimú developed highly refined textile arts before ceramics. 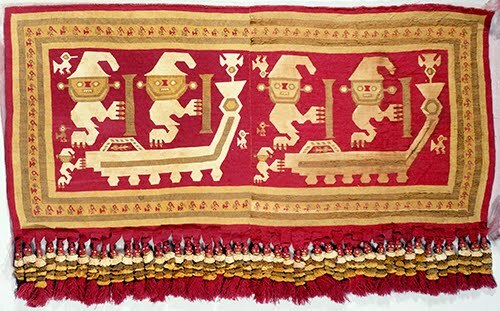 Textiles were the most highly prized objects in Andean cultures after gold. Chimú weavings were often used as money, so highly were they valued. 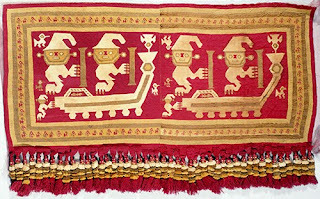 Chimú textiles were predominantly produced by male artists, using combinations of cotton and alpaca (camelid) fibers. Cotton had been cultivated in Peru since the 3000s BCE. 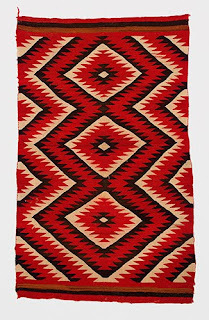 Navajo blankets were originally used mainly for clothing (“wearing blankets”). They were also used as covers over doors and room dividers. “Transitional” refers to blankets produced during the period 1880–1895, when the blankets became trade items with whites as rugs. 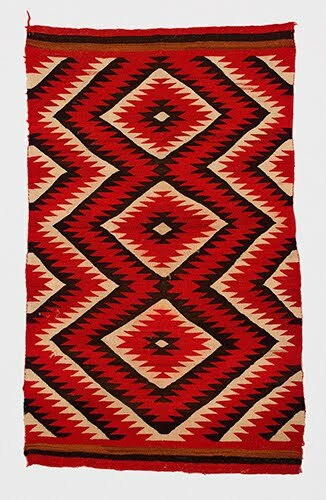 Before the 1880s, red in Navajo weaving was sourced from bayeta, a type of imported red flannel that would be unraveled and respun for use in blankets. Aniline dyes, chemical dyes derived from coal tar, were introduced by the 1880s. The symmetry and geometric straightness of Navajo designs represents the limitations of the upright loom, which does not accommodate rounded patterns. The jagged edges on the bands came from a cloud pattern, an element of nature that symbolizes change. The Navajo, an Athabascan-speaking people who occupy New Mexico and Arizona, were once nomadic and are thought to have northwestern origins, migrating from the interior of Alaska between the 1200s and 1400s CE. In successive migrations they settled in the Southwest and adapted elements of Pueblo culture—including weaving—making them uniquely their own. While men are traditionally the textile artists in Pueblo cultures, it was the women who tended and sheared the sheep and became the weavers in Navajo culture. They learned weaving from Pueblo men who had been raising cotton and weaving blankets since about 700 CE. Pueblo weavers were introduced to sheep wool by the Spanish in the 1600s. The Navajo acquired the churro sheep from the Pueblo weavers and developed it into their own unique breed. This last example is not, strictly speaking, a textile, but it is such an interesting piece that I had to include it! It is a headscarf that was featured in the 2005–2006 Safe: Design Takes on Risk exhibition at the Museum of Modern Art. The exhibit hightlighted more than 300 objects that were meant to protect people from a wide variety of contemporary anxieties and dangerous situations. I can only assume that this headscarf, similar to the hijab worn by Muslim women, is meant to protect women in the danger zones of the world. 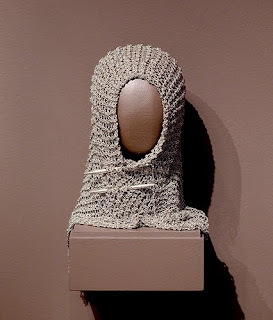 This headscarf is made from the same metal from which the chains for soldiers’ dog tags are made. Many of Galya Rosenfeld’s (born 1977) objects—jewelry to wall installations—are made from repurposed military-related materials. 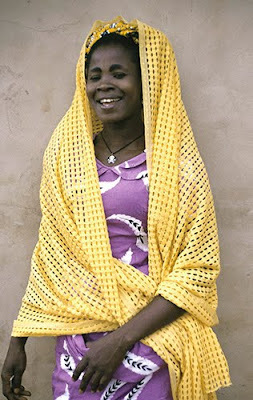 She mixes traditional techniques such as weaving with industrial materials. Her work is a place where the whimsical meets with common sense protection. Rosenfeld studied object design at the National Higher School of Decorative Arts, Paris (fashion) and Bezalel Academy of Art and Design, Jerusalem, Israel, Department of Ceramic Design.